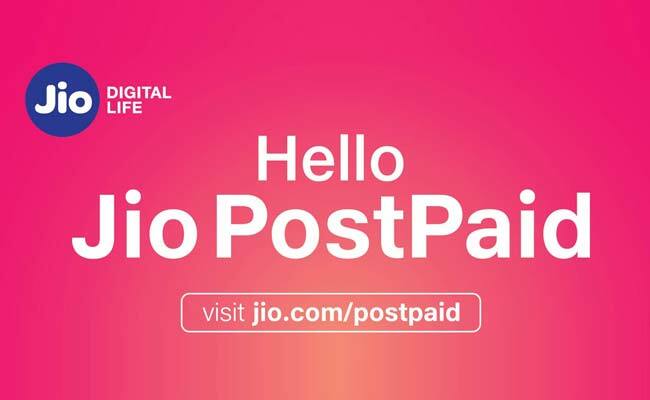 Reliance Jio launches JioPostpaid plans, which will come into effect from May 15, 2018. JioPostpaid plan at Rs 199 does not require you to pay anything for activation of international roaming. Reliance Jio on Thursday announced a series of new postpaid plans under its latest postpaid offering JioPostpaid. Reliance Jio's latest offering under its postpaid plans is 'zero touch', which means that customers do not have to get the services on these postpaid plans activated - they are pre-activated. The cheapest JioPostpaid plan is priced at Rs 199. With JioPostpaid, Reliance Jio said that it "will once again challenge the industry status-quo by offering the lowest tariffs in India and abroad to postpaid users, who end up paying disproportionately higher as compared to the prepaid segment". JioPostpaid plans will come into effect from May 15, 2018. 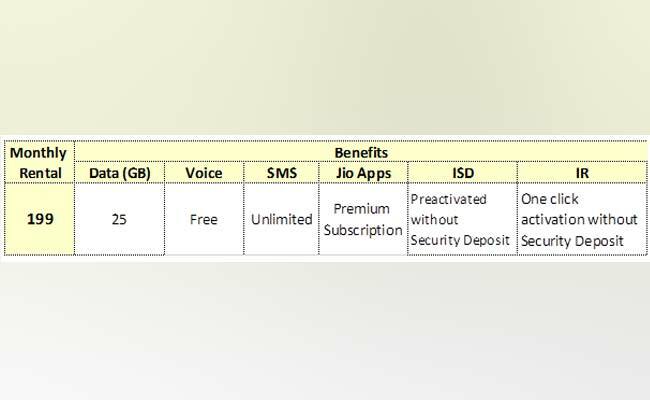 Jio's Rivals like Bharti Airtel and Vodafone India also offer postpaid plans in or around the same price bracket but their benefits vary. This postpaid plan of Reliance Jio offers 25 GB of data, along with free and unlimited local, STD and roaming voice calls. Unlimited number of SMS or short message service is offered for free. International roaming can be activated on this postpaid plan of Jio with one click and zero cost. All postpaid services such as voice, internet, SMS, international calling will be pre-activated in this postpaid plan of Jio. The credit limit offered in this postpaid plan of Jio is unlimited and it also allows for free subscription of all Jio apps, Jio sad in an official statement. Airtel offers postpaid plans under Airtel Infinity plans. 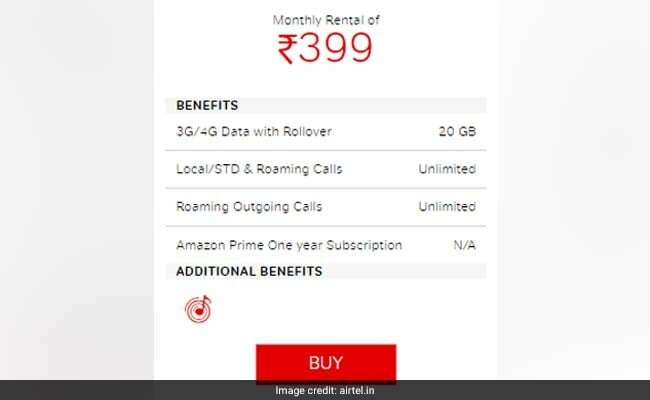 This postpaid plan of Airtel offers 20 GB of 3G/4G data with rollover facility. Local, STD and incoming and outgoing on roaming is unlimited, stated Airtel on its website, airtel.in. Additional benefits include a subscription of Wynk Music, a music streaming service of Airtel. In this plan, international roaming activation is chargeable at Rs 149 per month. Vodafone offers postpaid plan sunder its Vodafone RED bouquet of postpaid plans. 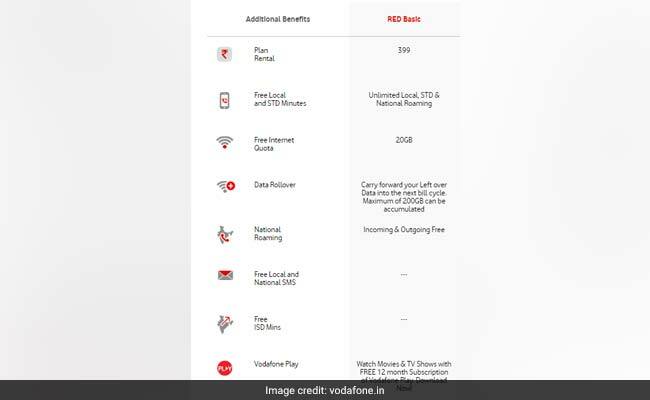 Vodafone RED postpaid plan at Rs 399 is the RED Basic plan. Local, STD and national roaming is unlimited in this postpaid plan. Incoming and outgoing in this postpaid plan of Vodafone is free. A total of 20 GB of internet quota is free with this postpaid plan of Vodafone. A total of 200 GB data can be rolled over to the next billing cycle, according to vodafone.in. Customers can watch movies and TV shows free for 12 months subscription of Vodafone Play, a one-stop entertainment destination for Vodafone subscribers. Under this postpaid plan, international roaming can be activated with a payment of Rs 149 per month. With new postpaid plans announced by Reliance Jio, competition in the telecom sector will further rise.